Wood represents one of nature's most beautiful products--which is why so many individuals choose to own home cooking products and decorations made from it. 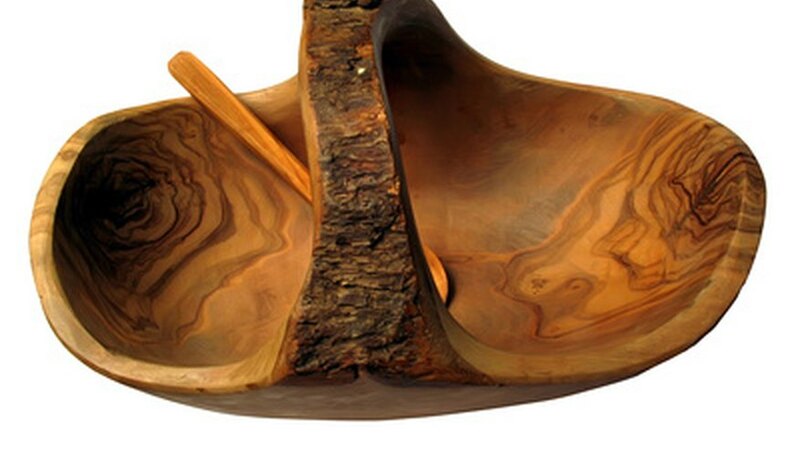 A versatile wooden bowl allows the owner the opportunity to decorate with the item, showing off the beautiful wood grain or using the bowl as a dining item. Over time a wooden bowl will become worn and need finishing in order to protect the wood and prolong the life of the bowl. Sand the bowl with 120-grit sandpaper. If removing paint or polyurethane currently on the bowl, ensure you touch on every area. Sand extremely rough surfaces to achieve a smooth finish. Sand the bowl with 220-grit sandpaper. Touch every surface of the bowl to achieve a smooth and even surface. Dampen one rag and wipe off the bowl. This will remove any dust caused by sanding. Residual dust can cause imperfections in the surface of the bowl once it is finished. Rub wood conditioner on the bowl with a rag. Apply an even coat over the entire surface of the bowl. Allow conditioner to set for 5 to 15 minutes until it appears dry. Apply wood stain to the bowl with a staining cloth. Allow stain to set for up to 15 minutes and wipe off with a clean rag. Allow stain to dry completely before adding a second coat or polyurethane. If you choose to apply a second coating of stain, wait a minimum of 6 hours between coats, and apply stain without resanding. Allow the second coat to dry 5 to 15 minutes and wipe off excess stain. Apply polyurethane with the sponge brush by dipping the sponge end tip into the polyurethane until a thin layer ends up on the brush. Brush the polyurethane on to the bowl in an even manner so you do not apply a lot in any one spot. Apply a second coat after 8 to 12 hours, if desired, and allow bowl to dry for 24 hours before using.